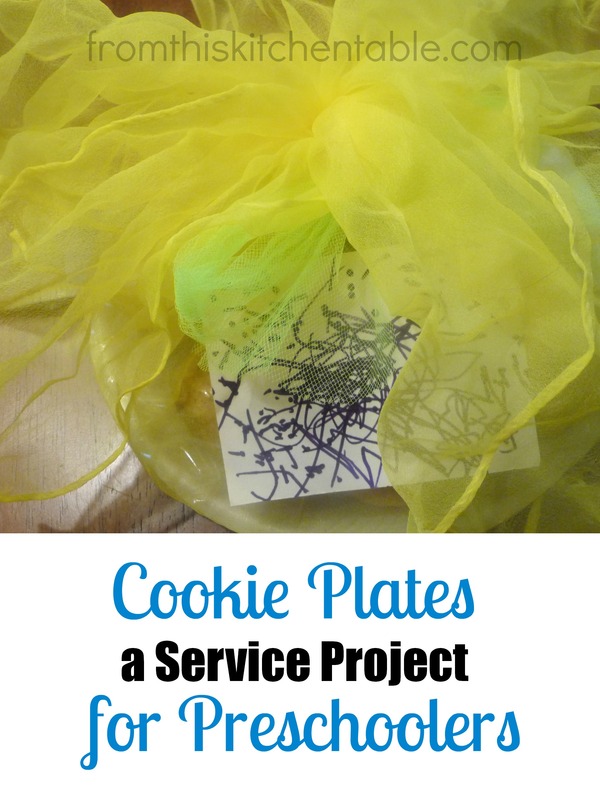 This is an easy service project that your child can be involved in from beginning to end. My husband was out of town one Saturday, so while the baby napped my toddler and I got busy. 1. Select who you want to bless with a plate of goodies. Our recipients were an elderly couple, two individuals who had been spending vast amounts of time working on our church renovation, someone whose birthday it was, and a friend. 2. Find a recipe (or two or three) to make. We made two different cookies and a pumpkin cranberry muffin. Yum. Then get busy cooking. My daughter helped measure, pour, stir and roll. 3. 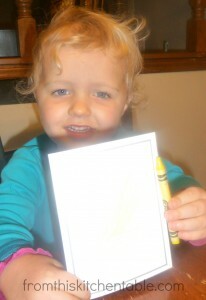 While the baked goods are cooling, get out your coloring supplies and have your child draw cards for each person. After the cards were colored I wrote notes on them. 4. 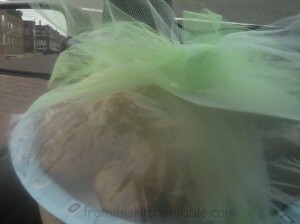 Distribute the food between paper plates, cover with plastic wrap, tie a ribbon around them and attach the card. 5. Deliver! This was my daughter’s favorite part. It was her “special deliveries”. I helped her walk up steps and let her stand there with the plate after we rang the door bell. She wanted to keep making more stops. From the smile on her face you could tell she felt important and that she was doing something nice. Having a 2 1/2 year old show up unannounced also made our recipients grin. Do you have a favorite way to involve your child in serving? Next week I will be sharing another opportunity we involve our children in. 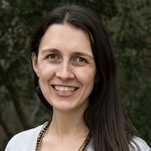 This entry was posted in Faith on November 14, 2013 by Deanna Michaels. Sweet!! We did this recently with some fall treats we made. We deliberately kept some extras to bring to the gentleman nearby who recently became a widower, and then we brought some to our pastor’s wife as a “thank you” for having my daughter over for a tea party. It’s important for kids to see service in action at an early age. Awww, that’s awesome! I’m sure you made their days and you kids were excited to make and serve. It really is important, I need to start being more aware of ways I can have my daughter be involved and serve. You know I’ve already stolen your idea 🙂 I think you mentioned cookie plates in an earlier post, and what did I go and do? Cookie plates! Instead of trick or treating for candy, the girls dressed up in their costumes and handed out cookie plates to elderly people at our church. I let them each choose someone to visit. Then each child created her own card and decorated her own cookies for that individual. When we told our elderly friends that our children chose them, they felt so special and loved. Oh it melted my heart watching my girls hug these sweet men and women. So, thanks for this great idea!! And I look forward to next week’s service project!! Yay!!! So glad that you guys did it too. What a fun thing to do instead of trick or treating. Love how they each picked out someone – I’m going to remember that. I’m sure you made your friends’ week. What a cool way to help our kids see how great serving and ministering to others is. Thanks, Missy! You are right, it’s always a little more time consuming (and messy, ha ha) to involve the kids. My daughter absolutely loved doing this.